The match for this campaign has ended and helped to raise money for the South Carolina Aquarium Sea Turtle Care Center! As Turtle Ambassadors we raised funds to ensure the continued success of the Care Center, which has rehabilitated and released over 200 sea turtles to date! $1,380.96 Donated of $1,000.00 goal including Match. $0.00 Matching Funds Remaining. Chris (Michelangelo), Cody (Raphael), Jimmy (Donatello) and Johnny (Leonardo) have been dressing up to run the Cooper River Bridge Run for years and decided to use the opportunity this year to help raise awareness and hopefully funds for a cause that is local and near and dear to their hearts. 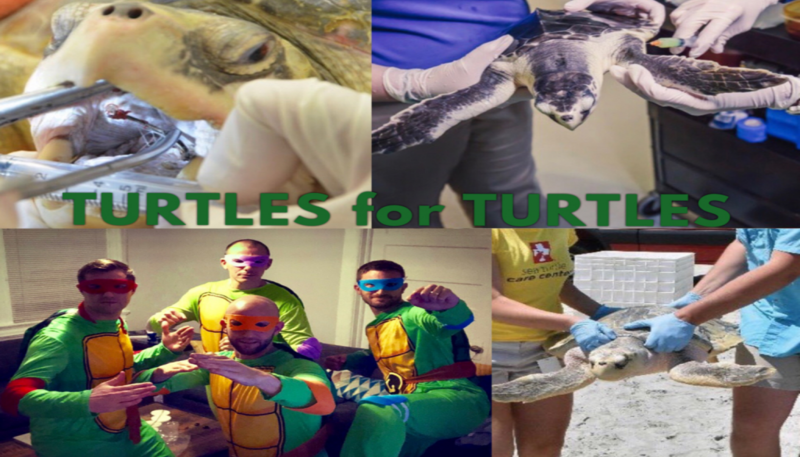 Although we Ninja Turtles live and exercise in the sewers, our family and friends in the ocean do not share the same appetite for pollution, so this year we will be donning our masks and running for the South Carolina Aquarium Sea Turtle Care Center. The average cost of treatment and care for each turtle is upwards of $50/day and so far the Care Center has rehabilitated and released over 200 sea turtles. With your help and donation, the Care Center will be able to continue caring for these endangered animals. Six out of seven species of sea turtles are listed as threatened or endangered,. This is a reflection of the growing issues surrounding coastal development and ocean conservation. To help ensure that sea turtles have a future in our oceans, the South Carolina Aquarium Sea Turtle Care Center aids sick and injured sea turtles in partnership with the South Carolina Department of Natural Resources. When a sea turtle is found stranded or injured, SCDNR brings the animal to the Sea Turtle Care Center for treatment. Sea turtles arrive most commonly suffering from debilitated turtle syndrome, shock from being exposed to cold temperatures, or injury from a boat strike or shark bite. The staff veterinarians diagnose each turtle and work with Care Center staff and volunteers to provide treatments and rehabilitative care. Patients are given IV fluids, antibiotics, vitamins and other medications. Based on the sea turtle’s condition, a variety of procedures may be performed, such as x-rays or ultrasounds. Rehabilitated sea turtles are released home in hopes that they will become reproductive members of the sea turtle population. Thanks to our friends the Ninja Turtles, who ran in the Cooper River Bridge Run, and collected money for the sea turtle hospital in Charleston...especially our Jimmy who read as Donatello 💗🐢🌊👍🏻. Thrupple husband, meat sauce, loop hole, and C money- you’re all ok. Sorry I’m late to the game.